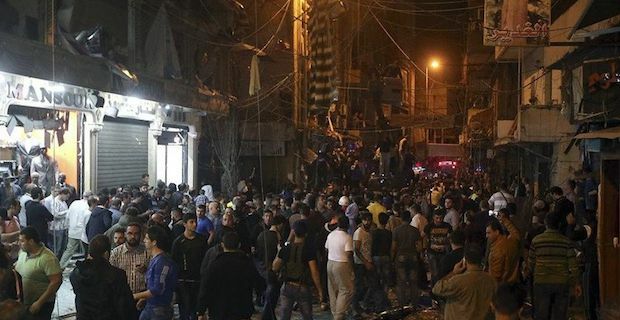 At 6:00 p.m. local time today 2 suicide bombs hit a Shia suburb in southern Beirut. So far it has left 37 dead and 181 wounded according to the Lebanese Red Cross. The two explosions occurred in the Burj al-Barajneh area which is a predominantly Shia area. Witnesses said that the 2 explosions were only minutes apart from each other. According to the Interior Minister Nouhad Machnouk, there are also unconfirmed reports of a third and fourth with one of them being killed in one of the explosions and another escaping on foot. This area is known as being a stronghold for Lebanon’s militant Hezbollah group who have been working with government forces in Syria, which not everyone likes. These explosions were said to be done by Sunni extremists, and this is not their first time. Between July 2013 and February 2014 they have attacked Hezbollah 9 different times leaving many residents feeling anxious and afraid. The last attack occurred in June 2014 and have threatened to carry out more as well. The explosions also went off only 200 meters away from Burj al-Barajneh Palestinian camps and also went off at the peak of rush hour. There is an urgent request for blood donations.